This article is about the character itself. For the video game with the same name, see Donkey Kong Jr. (game). For Donkey Kong as a baby, see Baby Donkey Kong. Donkey Kong Jr. (sometimes referred to as DK Jr. or just Junior) is a Kong character that debuted in Donkey Kong Jr. as the titular hero, who had to save his father, Donkey Kong, from Mario. He is considered the father of the current Donkey Kong except in previous instances suggesting that they are the same character. Donkey Kong Jr. as he appears in various different versions of Donkey Kong Jr.
Donkey Kong Jr.'s premier appearance is in the eponymous Donkey Kong Jr. He is the star of the game and the only playable character. It follows the events of the original Donkey Kong, where Donkey Kong Jr.'s father, Donkey Kong, has been locked up by Mario. Donkey Kong Jr. must travel through four stages, climbing vines to ascend them and then watching as Mario hauls his father further on through the game. There are numerous enemies that Donkey Kong Jr. must avoid. However, if he drops fruit on the enemies, they will be defeated. Once Donkey Kong Jr. has put a key into the cage, Mario will move Donkey Kong to a new area. When Donkey Kong Jr. beats Mario at last in Stage 4, Donkey Kong and Mario both fall; Donkey Kong Jr. catches his father and then walks off-screen with his newly-freed papa (in the NES version, this scene only has Donkey Kong Jr. catch his father, omitting the rest of the scene due to memory space issues.). In the original arcade game, he also appears during the transition scene for Stage 2 and Stage 3, where he pursues Mario's chopper with a parasol. One year later, Donkey Kong Jr. made another playable appearance in the game Donkey Kong Jr. Math. His father stood at the top of the stage, holding a sign with a random number placed on it. Donkey Kong Jr. had to climb amongst multiple vines to gather the correct numbers and mathematical signs to create the number on his father's sign. This game also starred a pink-colored palette swap of Donkey Kong Jr. that could be playable in a two-player game; however, Donkey Kong Jr. was still brown in color, and could be played as in both one- and two-player modes. In Donkey Kong on the Game Boy, Donkey Kong Jr. teams up with his father to kidnap Pauline, and Mario must defeat both of them before rescuing her. For most of the game, Donkey Kong Jr. usually stays in areas inaccessible by Mario, activating and deactivating switches in ways that can either help or harm Mario; nonetheless, it is shown in Stage 8-9 of Rocky-Valley that the plumber can lose a life when touching Donkey Kong Jr. Sometimes, Donkey Kong Jr. even appears out in the open and throws Poison Mushrooms. Finally, Mario got to stop him for good in Stage 9-4, where he locked him in a cage in a fashion similar to Stage 4 of the original Donkey Kong Jr. In the ending, Donkey Kong Jr. somehow managed to free himself and lay in wait as Pauline gave Mario a Super Mushroom to catch Donkey Kong, and acted as soon as his father was calling for help. In the end, the group of characters take a photo together. Donkey Kong Jr. appears as a cameo at the end of the Aqueduct Assault level in the background in Donkey Kong Country: Tropical Freeze inside a Wii U GamePad held high by the original Donkey Kong. Donkey Kong Jr., voiced by Frank Welker, is featured as the main protagonist of the cartoon short Donkey Kong Junior from the animated series Saturday Supercade. Here, Donkey Kong Jr., after discovering his father is missing from the circus, decides to track him down with the help of a clumsy biker named Bones. Donkey Kong Jr. makes an appearance in the sixth Nintendo Adventure Book, Doors to Doom; in the book, Mario and Luigi find themselves in Donkey Kong Jr.'s jungle after entering one of the doorways created by Dr. Sporis von Fungenstein. Upon seeing Mario and Luigi, Donkey Kong Jr. attacks them, forcing the two to flee. Eventually, after a vine-climbing chase, the Mario Bros. escape Donkey Kong Jr.
Donkey Kong Jr. appears as a playable character in Super Mario Kart for the Super Nintendo Entertainment System. He is classified as a heavyweight character alongside Bowser. His preferred item is the Banana, with which he would litter the racecourses. His kart has maximum top speeds; however, if he were to drift away from the main course, its speed would decrease greatly. In every Mario Kart title since Mario Kart 64, he has been replaced by the modern Donkey Kong, though Donkey Kong Jr. appears as a cameo in the background of Waluigi Stadium in Mario Kart: Double Dash!! He was also going to appear in Mario Kart: Double Dash!! as a playable character, but he was replaced with Diddy Kong. In the Super Mario Bros. 3 remake in Super Mario All-Stars, the kings of the Mushroom World are turned into different creatures than in the original. The Big Island King gets turned into Donkey Kong Jr. This happens in other 16-bit remakes of Super Mario Bros. 3, including Super Mario All-Stars + Super Mario World, Super Mario Advance 4: Super Mario Bros. 3 and Super Mario All-Stars Limited Edition. In Super Mario Maker, Donkey Kong Jr. appears as one of the costumes that Costume Mario can wear. Donkey Kong Jr. makes a cameo in Mario's Time Machine, appearing on several paintings in the background of Bowser's Museum. In Mario's Tennis for the Virtual Boy, Donkey Kong Jr. is a playable character. He is the largest character in the game. This is also the only game where he wears shoes and socks. 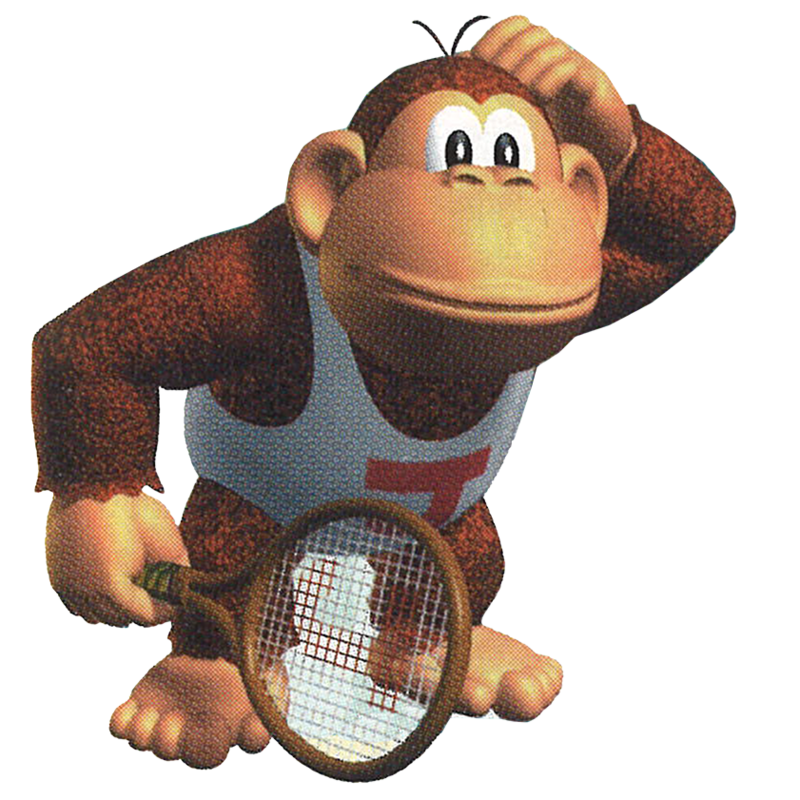 Donkey Kong Jr. returns as a playable character in the Nintendo 64 adaption of Mario Tennis. He is classified as a Power Character, who can be unlocked by winning the Star Cup in Doubles. He is one of two unlockable characters in the game, with the other being Shy Guy. If he is unlocked, he is Donkey Kong's double partner; otherwise, Yoshi takes his place. Donkey Kong Jr. appeared many times in the Game & Watch Gallery installments. Donkey Kong Jr. appears in the first two games with role as a "damsel in distress" in several of the minigames. However, Donkey Kong Jr. is the star of his own minigame which is a small remake of the original Donkey Kong Jr. Game & Watch game. The same minigame from the third game also appears in the fourth installment of the series. Donkey Kong Jr. also has a trophy in Super Smash Bros. Melee, though he does not make a playable appearance. 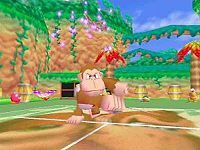 In Super Smash Bros. Brawl, Donkey Kong Jr. did not return as a collectible trophy, though data extracted from the disc shows that he was going to appear but was scrapped. Instead, he has a Sticker. The sticker shows Donkey Kong Jr. with a key over his head; the sticker is only referred to as Junior. It raises launch resistance by twenty-one in the Subspace Emissary adventure mode of the game. His other sticker shows him holding a tennis racket from Mario Tennis. Additionally, one of the names that appears when the player presses the "Random Name" button when naming their custom stage is DKJR. Donkey Kong Jr. appears in Super Smash Bros. Ultimate as a spirit. In the first game in the series, Donkey Kong Jr. can be found watching the fight in the audience along with Mario and Luigi. In the second arcade (and second overall) game in the Punch Out!! series, Donkey Kong Jr. can be found in the audience again, along with Mario, Luigi, and Donkey Kong, this time with a different color scheme. Donkey Kong Jr. appears as a participating racer and an opponent to Mario in the Super Mario Kart adaption in one of the volumes of the Super Mario-Kun. Donkey Kong Jr. appears in the e-Reader commercial, where he is on an assembly line where he undergoes a grooming makeover, only to be literally smashed into an e-Reader card. Donkey Kong Jr. bears a resemblance to his father. He has brown fur and wears a leotard with the letter J on it. His size varies between games, but is usually smaller or about the same size as the current Donkey Kong. Donkey Kong Jr. is portrayed as the hero of his own game and a villain of Mario in Donkey Kong for the Game Boy. He always sides with Donkey Kong, and is shown to be athletic and mischievous. Arcade 1982 Donkey Kong Jr. came to the rescue when Mario imprisoned his father. DK Jr.'s challenge was to collect the keys to Donkey Kong's cage, all the while dropping fruit on his enemies from high above. He was able to climb faster by using two ivy vines at once. This ape is also quite skilled at kart racing, tennis, and mathematics. For this subject's image gallery, see Gallery:Donkey Kong Jr..
Donki Kong - Mladshiy Donkey Kong Jr.
Oddly, several games in which Donkey Kong Jr. cameos contain doppelgängers. Such examples of these games include the Game & Watch Gallery series of remastered compilations (which seem to depict Donkey Kong Jr. as a species rather than an individual character), Donkey Kong Jr. Math which includes a second Donkey Kong Jr. recolored pink, and Mario Kart: Double Dash!! which includes Donkey Kong Jr.-like audience members at Waluigi Stadium. During development of Donkey Kong Country, Diddy Kong was originally intended to be a redesign of Donkey Kong Jr., though Nintendo did not like the complete redesigning of the character and ordered that either Donkey Kong Jr. have his original appearance or the redesign be made into a new character. ↑ "Super Mario Kart is the only Mario Kart game to feature Donkey Kong Jr. Due to the success of Donkey Kong Country, all future Mario Kart entries featured Donkey Kong, who is actually Donkey Kong Jr.’s son, with Cranky Kong, aka Donkey Kong Sr., canonically being the character featured in the original Donkey Kong game. Makes sense, right?" - Playing With Super Power: Nintendo Super NES Classics eGuide, Super Mario Kart 16 Bits Tab. ↑ Scribes - April 25, 1999. Rareware Website Archive. Rareware.com. Retrieved April 13, 2017. ↑ Super Mario Kart Japanese instruction booklet, page 22. ↑ As revealed in Retro Gamer magazine. "Mississippi Madness" • "Gorilla Gangster" • "Banana Bikers" • "The Incredible Shrinking Ape" • "Movie Mania" • "Gorilla My Dreams" • "Little Orphan Apey" • "Circus Daze" • "The Great Ape Escape" • "Apey and the Snowbeast" • "How Much is That Gorilla in the Window?" • "Private Donkey Kong" • "Get Along Little Apey" • "Sir Donkey Kong" • "The Pale Whale" • "El Donkey Kong" • "New Wave Ape" • "Greenhouse Gorilla" • "Hairy Parent"
"Trucknapper Caper" • "Sheep Rustle Hustle" • "Rocky Mountain Monkey Business" • "Magnificent Seven-Year Olds" • "The Ventriloquist Caper" • "The Great Seal Steal" • "The Jungle Boy Ploy" • "Junior Meets Kid Dynamo" • "Amazing Rollerskate Race" • "A Christmas Story" • "Gorilla Ghost" • "The Teddy Bear Scare" • "Double or Nothing"
This page was last edited on March 16, 2019, at 21:56.